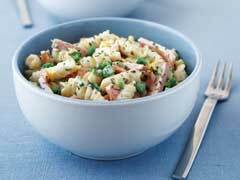 COOK Rotini Pasta in boiling water in large saucepan 8 min., stirring occasionally. MIX contents of the Broccoli Pouch, ham and vegetable blend with the ingredients in saucepan. Continue cooking 5 min. ; drain. Do not rinse. ADD Cheese Sauce and Italian seasoning; cook until heated through, stirring occasionally. Creative Leftovers: This is a great way to use leftover baked ham.